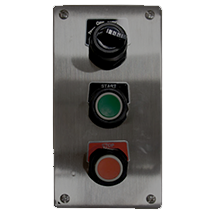 Sealed Control Station - Solution Control Systems Inc. Sealed Control Station - Solution Control Systems Inc. This control station approved for Class I Div 2 area only . This is custom built using operators having sealed contacts and nema 4X stainless steel enclosure.